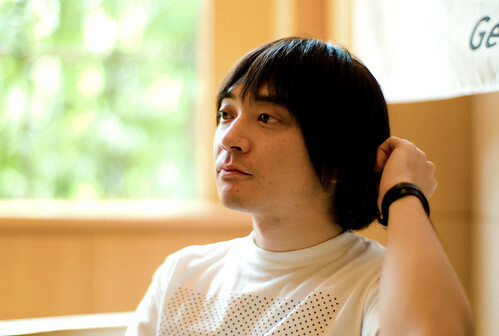 According to Wikipedia, "Cornelius (born Keigo Oyamada (小山田圭吾) January 27, 1969 in Setagaya-ku, Tokyo, Japan) is a Japanese recording artist and producer. Oyamada's first claim to fame was as a member of the pop duo, Flipper's Guitar, one of the key groups of the Tokyo Shibuya-kei scene. Following the disbandment of Flipper's Guitar in 1991, Oyamada donned the "Cornelius" moniker and embarked on a successful solo career." Keigo's mother is my mother's cousin. Keigo's grandmother moved to Tokyo in her youth while my grandmother stayed in Northern Japan to run our household. Keigo and his cousins became our local "family" when we moved to Tokyo since my first cousins were either in Northern Japan or in the US. When we used to get together as an extended family, our older cousins used to cheat us out of our allowance and everyone used to tease Keigo because he was always the funny little kid. As we became teenagers, we hung out a lot and listened to music together. We listen to a lot of stuff like Bauhaus, Siouxsie and the Banshees and The Clash. When both of our families were going through a somewhat difficult financial period and his mother was working for my mother, we both lived in a dumpy old love hotel in Shibuya that had been converted to a dumpy old apartment. Keigo was in Jr. High School at the time. He had a little cult following in his school, some kid writing a school comic strip about Keigo and his escapades. (If I remember this correctly...) I remember his mom being called into school regularly to make Keigo apologies for random things... I don't remember the details. I remember him practicing the guitar all the time and talking about starting a band. One day, I heard that his band was a huge hit - Flippers Guitar, his first band. As they say, after that it's history... Keigo's music has evolved and it always involves a humble, funny and experimental attitude. I see his awesome mother, our humble teenage environment and our playful family in his music. I remember hearing that NHK had invited him to be a judge on a music show. When the host asked Keigo what he thought, he pointed out that the host had a nose hair sticking out and Keigo wasn't invited back... I guess she didn't think it was very funny. Now Keigo has a wife, house, a super-cute kid and has mellowed a bit with age. On the other hand, his music aged well and continues to inspire me to experiment and remain playful. We're hoping to collaborate more directly more and he's helping with Creative Commons these days. Joi, good luck with the new project. My wishes that it turns out into a nice book. An excellent way to use a blog to write a book. I started a book writing project at http://www.unconference.info. I realise that even though unconferences are so popular globally, there aren't books on this subject. It's going slow. Will try to use the blogging method to get there. Joi - these are really interesting. I've read every one of them now (the picture of Howard looks like it's here in Scotland!). Know what you need? Geni for friends... how neat would that be? Oh and as i've said many times before - add Dandefife to that for a killer product. Just wanted to tell you I love your photos and I love your texts. I've been a big fan of Cornelius for years, and it's really interesting to hear such a personal account of his childhood. I also had a look at your bio, and became increasingly jealous of you and your interesting life, and all the interesting people that you apparently have crossed paths with. I was also amazed to see you are on boards of so many companies whose products I use - I found you through flickr, then looked you up on Wikipedia. And I've got a Technorati-search open in another tab of - you guessed it - my Mozilla Firefox. Marcus: We always need a bit of luck. Thanks! Joi Ito - "Keigo Oyamada aka Cornelius" by Joi Ito is licensed under a Creative Commons Attribution 4.0 International License.